Hydrolysed Marine Collagen Powder 300g Plus Essential Vitamins is a high strength collagen powder which is easy to take as a liquid drink shot. 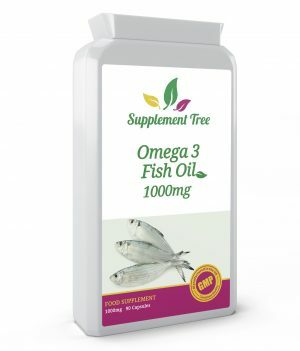 Orange flavoured Supplement Tree Collagen shots provide fast and effective collagen supplementation that can be taken as a tasty drink. Research has shown that healthy collagen levels help skin hydration; support skin tone, radiance and structure; and help promote healthy and young looking skin. Hydrolysed marine collagen is the type that has been used most successfully in research to show the health support effects of collagen on skin, bone and tissue. 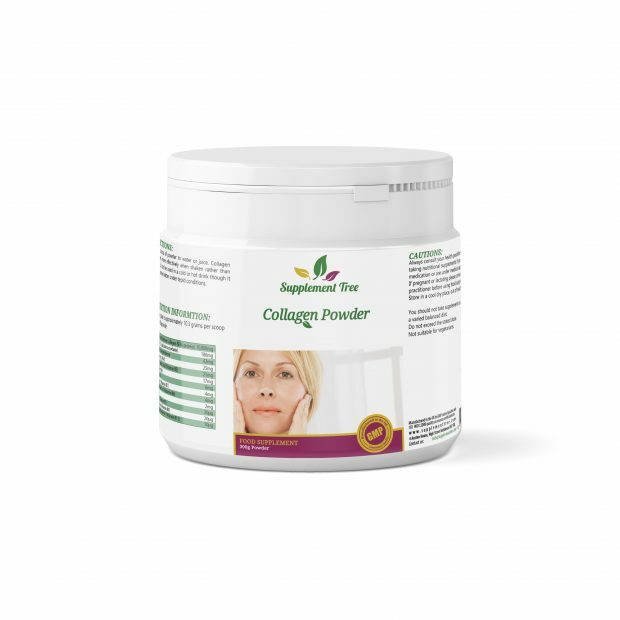 Collagen is a natural skeletal protein and is one of the body’s most abundant components, making up nearly 80% of the body’s skin, muscles and connective tissue. Reducing levels of collagen in the skin is the main reason for the formation of lines and wrinkles. It is thought that from the age of 25, your body’s collagen levels deplete at a rate of 1.5% per annum. This means that by the age of 35 your body will have lost 15% and by 45, 30%. It is at this stage that you really start to notice a change in your skin’s elasticity and texture. Healthy collagen balance in the body is therefore highly desirable, and crucial, if your looks and facial structure are to be maintained. The percentage of collagen that is actually absorbed into your body when ingested (bioavailability) is critical to the effectiveness of the supplement. Bioavailability largely determines how well any nutrient you ingest works. The issue with collagen molecules is that they are enormous, so unless they’ve been hydrolysed, they are simply too big to be absorbed when ingested, and thus never reach the dermis, which is the underlying layer of the skin where collagen lives. Supplement Tree Hydrolysed collagen absorbs quickly into the body and is allowed to make it’s away to the areas it is needed most. 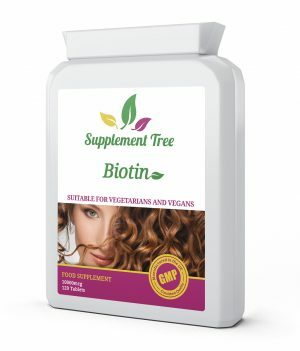 Supplement Tree Collagen Powder is manufactured in the UK to GMP code of practice and ISO 9001 quality assurance certification. Not suitable for vegetarians or vegans as collagen derived from fish. 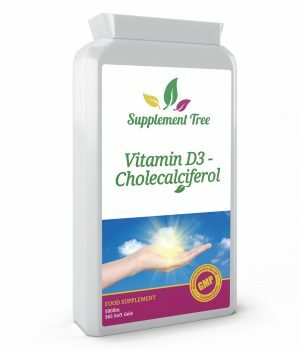 Convenient high strength collagen powder, easily taken as as a liquid drink shot. Helps maintain healthy skin hydration. Supports healthy skin tone, radiance and structure. Helps maintain healthy and young looking skin. Hydrolysed collagen can move more easily to where it is needed to provide a more efficient supplement. 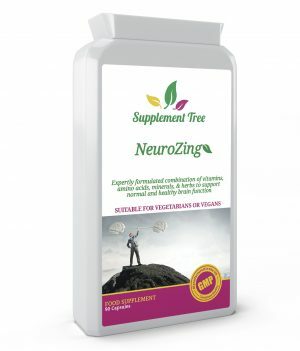 Supported by specially chosen range of essential vitamins and minerals. Manufactured in the UK to GMP code of practice and ISO 9001 quality assurance certification to guarantee consistent high quality. Add 1 scoop of collagen powder to a tepid container of liquid – water or juice. The collagen powder usually dissolves better when shaken rather than stirred. Allergy Advice – contains sources of fish.